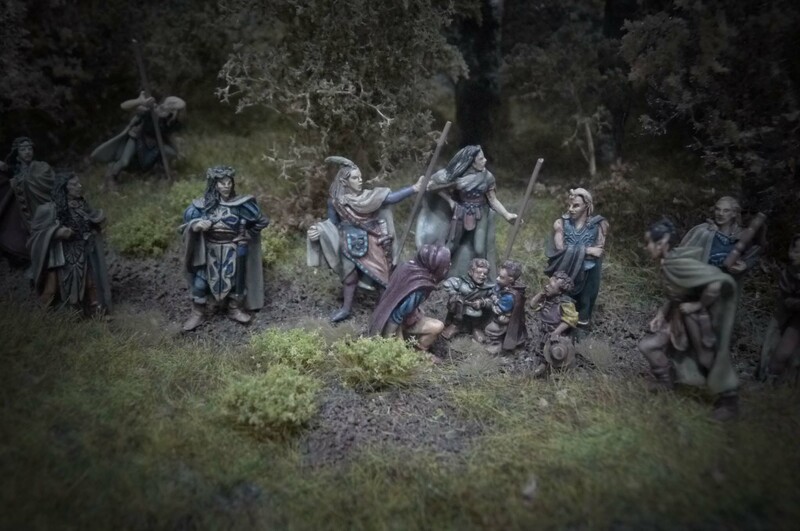 My latest little scene based upon the hobbits meeting Gildor and the elves. 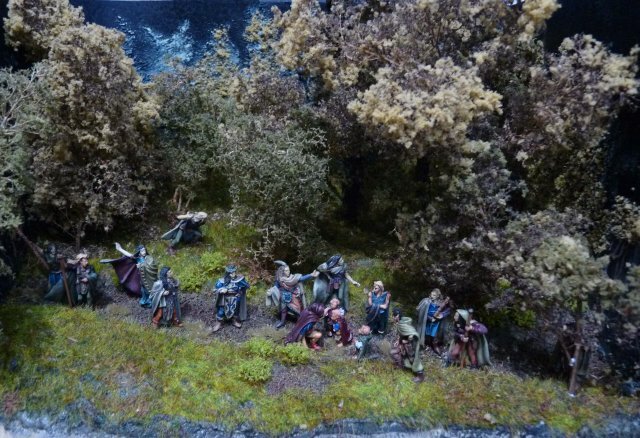 This has been a long-simmering project and was a good excuse to use some elf miniatures who had been hiding for too long in some dark corners of Rivendell. This is my interpretation so where artistic licence has been used this has been my choice. The scene has yet to be placed in a protective display box, but that will be another project. 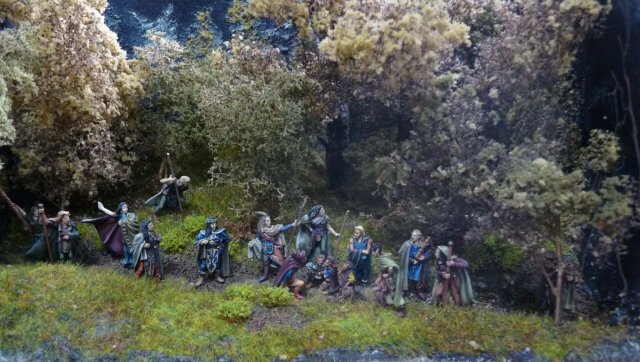 Great scene and original using of many figures ; I also see some nice conversions. Beautiful painting and very nice scenery. I love it! Well done! Pretty awesome master ddaines! I bet our Master Ent loves the trees! huuooomrhuom ... excellent, Master Ddaines ... that diorama is impressive and (again) well-arranged. Extraordinary choice of the figures provided together with excellent paint-jobs. - I really do like it very much. I also like the masses of trees and the mud on the path very much (you also had to cope with mud in the streets of Bree once, if I do remember well). Indeed, there's a lot of important work still to be done for building a "protective display box" as you put it (which can turn out to be a hard job considering the size). Thank you very much for providing the pics here. Cheers. I love your work David. Miniature set is so complementary. Your painting is getting better every time you show us a new artwork. You may be able to challenge Master Elroi one day! 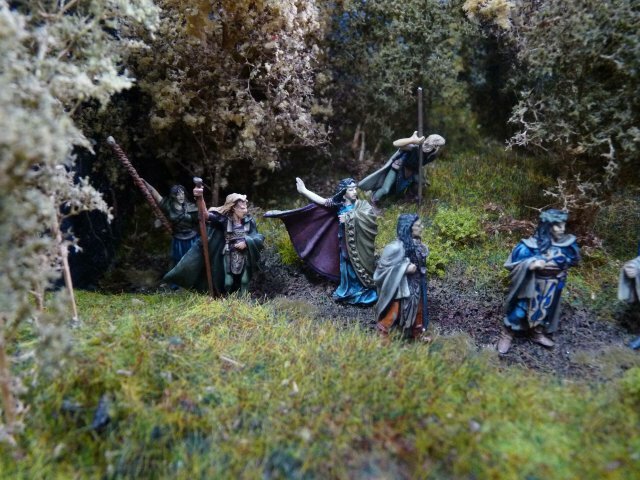 Diorama, well natural and sourrounded by trees, what else could an elf wish ? I wonder if maybe 1 or 2 horses could be with them. Challenge Master Elroi , no he is the Master of the Brush and my eyes are getting tired as the years pass so I have to rely on visual effect rather than raw 'skill' to achieve my results, but thank you very much for the kind words. As to horses, well I didn't even consider them to be honest as they are not mentioned in The Book, and I am sure if they were then the tired hobbits would have been put atop of them. That said, maybe a 'pack-pony' would've added some 'interest', but I do try to stick to the book where possible. Thank you Master Tree and others who have commented, for your kind words, I have included in the Mithril Gallery section some work in progress images that show how the idea evolved from using plastic trees to the 'real thing' and Sea-foam (if you haven't tried this it is very useful for trees/bushes). 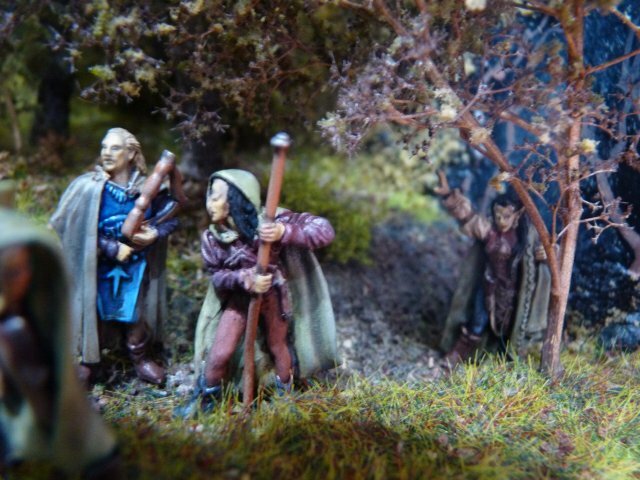 Anyhow, Illuvatar willing I hope to 'pull my finger out' and add to the dioramas with some key scenes from the Long Expected Party to The Grey Havens (and Samwise returning home ). Great work on these David! I love how it has a nice "by the night" ambient/aura... with somewhat cold and desaturated colours on it. absolutly wonderful diorama, I'm glad to be part of it somehow the flora is excellent too !